Reconsidering the influential design movement on its 90th anniversary. 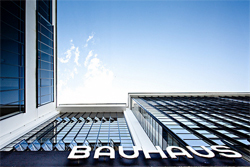 There was nothing nice about Bauhaus. The Bauhaus artists were in love with death and destruction. Sure, they wanted to build. But they wanted to build from a fresh pallet, a tabula rasa. They were militants when it came to art. Art, for them, wasn’t simply about beauty, or function, or form. Art was about everything. They would make art life and life art. And all of it would have clean lines and sharp angles. The whole world would be glass and steel. They would smash the universe into a better version of itself.